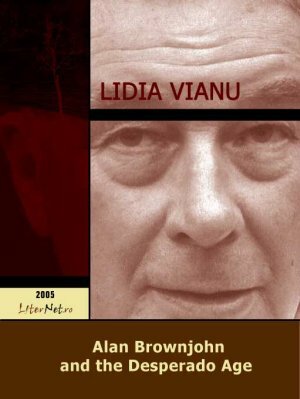 The latest book by Prof. Dr. Lidia Vianu, Alan Brownjohn and the Desperado Age is an exhaustive study of the work of Alan Brownjohn, one of the most outstanding, and widely known and read postmodern British authors: a poet, novelist and literary critic at the same time. The book is unique in that it is the first and only attempt at introducing Alan Brownjohn to the specialized public anywhere as well as to the wide readership in Romania with an interest in British postmodern literature. Professor Vianu’s book approaches his work exhaustively, presenting Alan Brownjohn the poet, the fiction writer and the literary critic. The remarkable absolute novelty of the book is that it discusses the criticism published by the author in periodicals. Alan Brownjohn himself cooperated closely in writing this book. The work is monographic in nature, dedicating extensive distinct chapters to poetry, fiction, criticism, interviews with the author as well as his place within what Prof. Vianu has called “The Desperado Age” i.e. the British postmodernist movement. This last one includes a selection of poems. The reader will also find enclosed a chronology and a complete, up-to-date bibliography of Alan Brownjohn providing useful information for those who want to get acquainted with the life and work of this remarkable writer. Alan Brownjohn and the Desperado Age makes an excellent and a delightful reading bearing the signature of Professor Vianu, an experienced literary critic and translator, and a poet herself. This book was published in paper format by Editura Universitatii din Bucuresti.